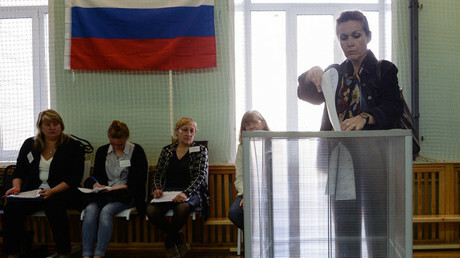 In the latest unified Election Day, voters across Russia elected 36,000 representatives, including heads of 16 regions. All winning regional leaders represent United Russia, but opposition has strengthened its positions in many municipal councils. The results of Sunday polls are yet to be finalized by the Central Elections Commission, but by Monday afternoon it has become clear that United Russia candidates are winning in the first round in all 16 regions electing their governors or heads of republics. According to the preliminary results of the vote count five of the winners got reelected for a new term, but for 11 others these were the first elections in their careers. These politicians have been appointed acting heads of their regions in winter and spring and for them the Sunday ballot was a test of the public’s trust. Business news website RBC quoted an unnamed source in the Russian presidential administration as saying that the victories of the freshly-appointed acting governors prove that there is a demand for political changes in the society. They also test a working scenario for renewal of the ‘gubernatorial corps’. The source also told reporters that the course for renewal would continue with appointments of about 10 more new acting heads of regions within the next few months – so that the newly-appointed politicians could run as incumbents in March 2018. Another important part of the Sunday unified Election Day was the election of deputies in municipal councils in the Russian capital, Moscow. The post of municipal council member is very basic and relatively unimportant, but the law orders all candidates in mayoral races to obtain support from deputies in municipalities, known as the “municipal filter.” With Moscow mayoral elections due in a year the political composition of municipal councils becomes more important. This can be explained by the effort of Dmitry Gudkov – a former State Duma MP who started preparations for the 2018 mayoral race with a major campaign aimed at putting opposition activists in municipal councils so that their signatures would allow him to pass the municipal filter. In his electoral campaign, Gudkov sided with the opposition parties Yabloko and PARNAS (Party of People’s Freedom) and with turnout at municipal elections being relatively low, their efforts yielded some results – according to preliminary results of the polls reported by monitors independent activists got the majority of seats in 36 municipalities located in 27 of Moscow’s 146 districts. Also on Monday morning, Interfax quoted the head of the Moscow City Elections Commission, Valentin Gorbunov, as saying that United Russia candidates received almost 77 percent of seats in municipal councils, the Yabloko party was second with over 11 percent and independent candidates were variously in third place with over 7 percent. Other opposition parties, including those with parliamentary representation, received less than 3 percent of the votes combined, Gorbunov said. The elections across the country were conducted under slightly new rules – the responsibility for avoiding poll rigging has been tightened recently and the Central Elections Commission had taken additional measures to prevent possible abuse. In particular, it installed monitoring cameras not only at ballot stations, but also in the offices where the results of the voting will be transferred into the nationwide automated vote-counting system. No important violations have been reported so far with the exception of the Far East city of Vladivostok, where a member of the elections headquarters of a United Russia candidate for the city legislature was arrested and charged with attempted bribery of monitors seeking to falsify the results of the early voting. 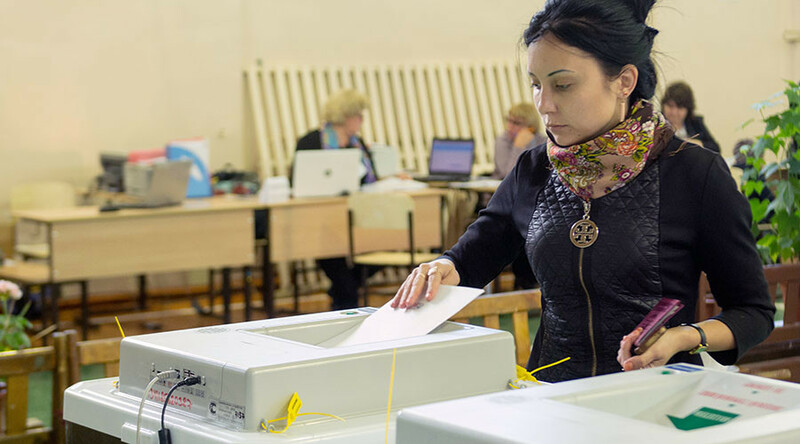 The head of the Central Elections Commission, Ella Pamfilova, told reporters that one monitor had to be forcefully removed from a polling station in the Russian Baltic exclave of Kaliningrad. “He was totally drunk – this was the only recorded incident so far,” REN TV quoted her as saying. 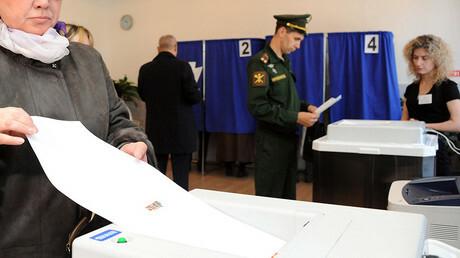 Another particularity of the Moscow municipal elections was the vote cast by President Vladimir Putin. Putin told reporters at the ballot station that before coming there he had thoroughly studied the biographies of candidates, but refused to say whom he had chosen to support. “But this is classified information,” Putin said, apparently referring to the law that bans all political promotions on the day of elections and on the day before it.